He isn’t skating on the NHL stage any more, but Cody Hodgson’s passion for hockey – and sharing his affinity for it – has never been stronger. There was no way anyone could miss the big smile that greeted them during the autograph sessions that took place in Haliburton, Ontario over the weekend of October 14-15. 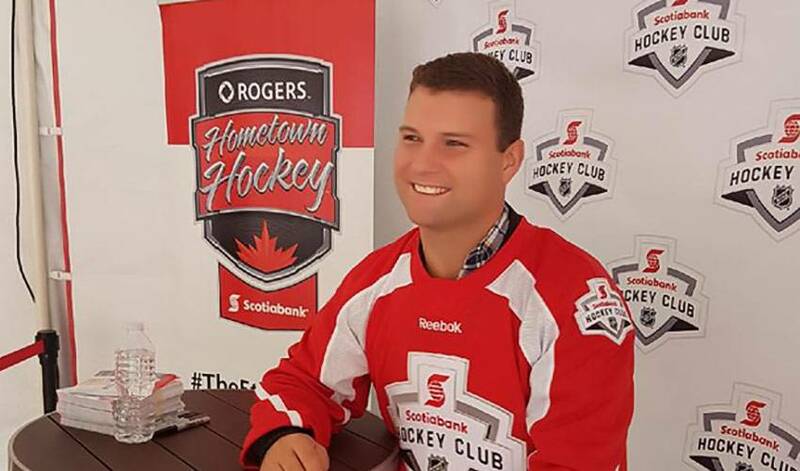 Hodgson, along with several other former NHL players, were on hand as part of the Hometown Hockey Tour, the cross-country fan festival that stops in 24 different Canadian communities this season to celebrate local hockey stories and the game’s biggest stars. Now 27, Hodgson, the 10th overall selection of the Vancouver Canucks in 2008 retired from the NHL on October 3, 2016. After contending with several health issues throughout his final campaign in 2015-16, including shortness of breath and heart arrhythmia, the centreman went through a battery of tests to determine the root cause of his symptoms. He was diagnosed with a genetic disorder known as malignant hyperthermia. When he was told what it was, doctors also informed him his NHL career was over. Hodgson finished his career having played in 328 regular season games – with Vancouver, Buffalo and Nashville – along with 12 more post-season appearances. Hodgson, who played minor league hockey with Colorado Avalanche star and fellow Haliburton, Ont. native Matt Duchene, knew his bond with the game was far from over. When the Nashville Predators asked if he had any interest in running their Little Preds Learn To Play youth hockey program, Hodgson immediately embraced the opportunity. During the 2017-18 hockey season, over 1,700 boys and girls (age 4-9) will discover the sport of hockey for the first time through the initiative. It will be offered in rinks throughout Tennessee, Arkansas, Alabama, Georgia, Mississippi and Kentucky. “I think it’s an amazing program,” said Hodgson. “The NHLPA and the NHL (who supply equipment free of charge) partnered together on a fund that will help grow the game and I think that’s the best way to do it, at the grassroots level, where kids are just getting their start in hockey. It’s so expensive to play hockey, so anything we can do to subsidize the costs – it’s completely subsidized by the League and the NHLPA – really makes a big difference. Parents come up to me and that’s what they are most appreciative of with the program. Hodgson, who played alongside Duchene on a summer travel team until he was 13, is clearly relishing his new role, one that takes him on some unique road trips. The former Canadian junior star, who won Ontario Hockey League and Canadian Hockey League player of the year honours in 2008-09, sees a little of himself in the kids that take part in the programs. Something Hodgson hopes the kids he meets will recall one day, too.